On Ash Wednesday, three Pilsen Parishes registered families to take care of a child should their parents be detained or deported in response to increased concerns over ICE deportations. 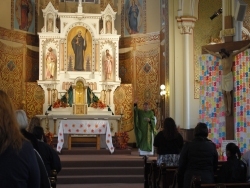 Pilsen parishes organized rapid response teams in each parish. 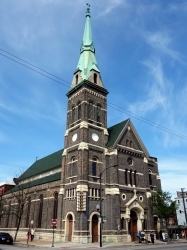 Saint Paul Catholic Church, St. Procopius Catholic Church, and St. Pius Catholic Church helped ensure that legal protection is provided to families. ‘During this holy season of Lent we are called to reflect on our love for God and our neighbor. The bible tells us to see the presence of God in the stranger. We live in a time where strangers are feared and live in fear. 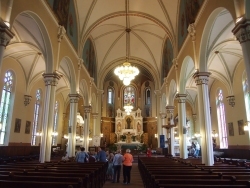 The Catholic Bishops in the United States have said, “We call upon all people of good will, but Catholics especially, to welcome the newcomers in their neighborhoods and schools, in their places of work and worship, with heartfelt hospitality, openness, and eagerness both to help and to learn from our brothers and sisters of whatever religion, ethnicity, or background. Here in Pilsen, the failure of our politicians to resolve immigration issues is being felt personally by us in our families, with our friends, our neighbors, and our churches. We in Pilsen have always been a community of immigrants and we are proud of our history. Because of our faith and our love for our brothers and sisters we are taking the following steps. We are organizing rapid response teams in each parish. The teams will help insure that legal protection is provided the immigrant, protest against arrest, alert the community, call the press and offer legal advice. We are organizing families in our parishes to receive children when families are separated. If you are interested in signing up and being screened as a possible host family, please sigh up on the way out of church today,” Fr. Jose Santiago, Saint Pius V Parish, Father Gary Graf, St. Procopius/Providence of God, Fr Michael Enright, Saint Paul & Saint Adalbert’s released in a statement.